When it comes to food hunting, I sometimes overlook small restaurants because I’m too busy focusing on a bigger catch. 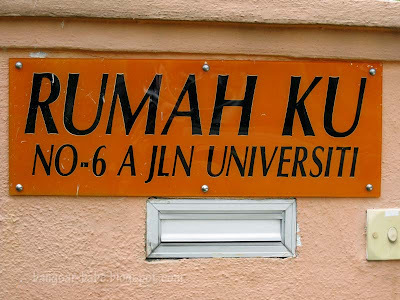 Rumah Ku Gallery and Café is one of them. 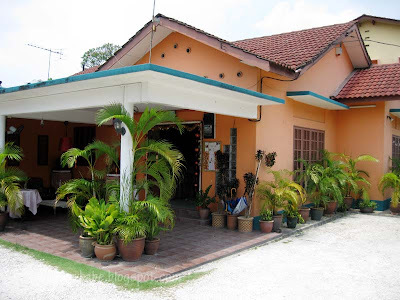 Located along Jalan Universiti (opposite University Hospital), I never knew it existed until a good friend told me about it. 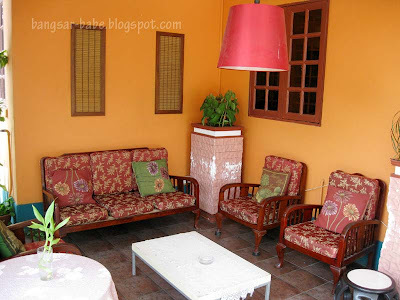 The place has a homely feel with a nice lawn for alfresco dining and themed dining areas – Malay, Chinese and Indian dining rooms. 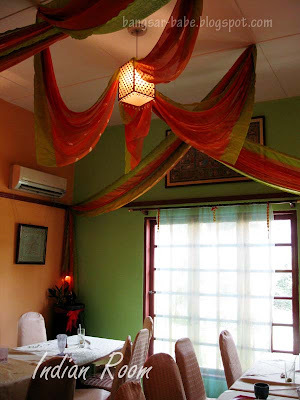 The Malay Hall has wood carving and lovely floral batik decorations, while the Chinese Room boasts Chinese red silk, marble tables and an elm wood desk. 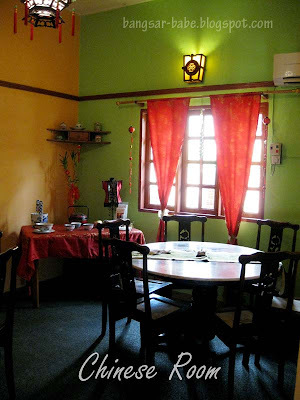 The Indian room is fashioned with woven cotton and bronze and wood statues. I wanted to sit in the Indian room but it was occupied for a function, so I sat in the Malay hall. 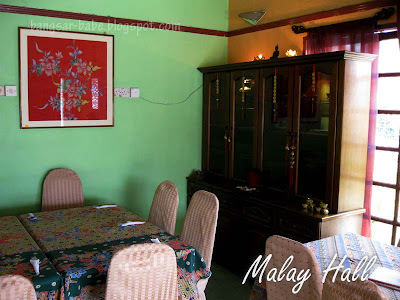 Once seated, rif and I scanned through the menu, which had a good mix of Malay, Indian and Chinese cuisine. I tried the Banana Leaf Meal (RM6), and added a serving of fish masala (RM6) as I was told it was delicious. It was. 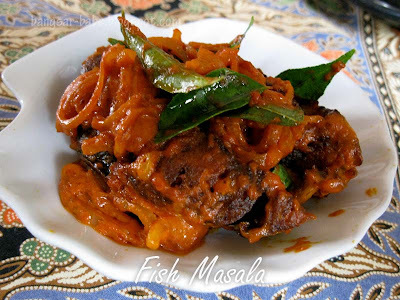 The fish was spicy without numbing your tongue, and its flavours were bold and distinctive. 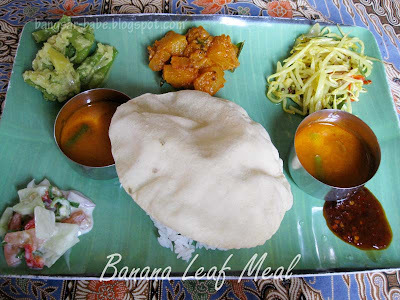 I enjoyed the banana leaf meal, especially the acar but the portion was slightly on the small side. 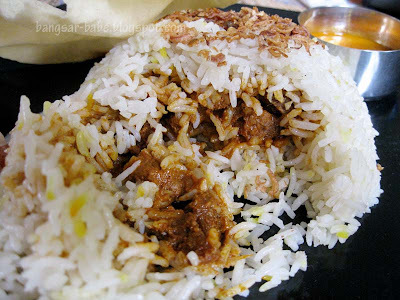 rif’s mutton briyani set (RM9.90) was just as good. 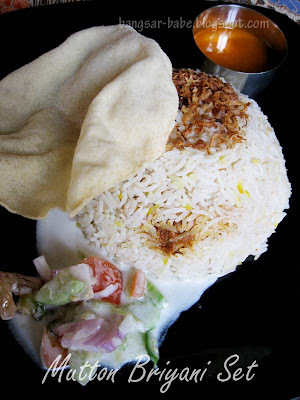 The fluffy long grained rice was lightly infused with spices, and beneath the heap of rice was a scoop of tasty mutton briyani. Each piece of mutton was tender, piquant and nicely flavoured by the spices. 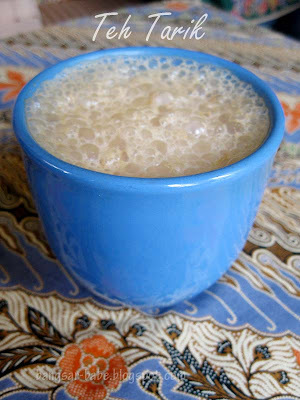 The accompanying dhal was thick and went well with the briyani. The braised brinjal in claypot (RM10) was average. 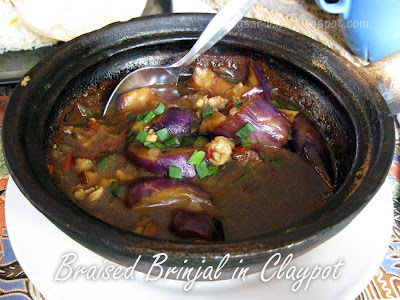 It tasted very much like claypot tofu, but instead of tofu, it was brinjal. I spied the table next door having the brinjal sambal, which looked quite good. Maybe I’ll have that next time. 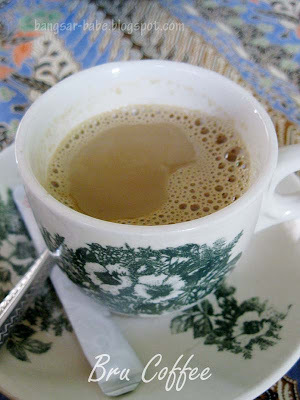 The teh tarik (RM2) was nice and frothy, but my bru coffee (RM3) lacked spices and it wasn’t fragrant enough. All in, the food was good and satisfying to the palate. I can’t say the same for the portions, as the dishes were slightly on the small side. However, note that I’m greedy and quite a big eater, so you might find the portions just right. Service was prompt and friendly. Verdict: Home-cooked food that is delicious and affordable. yar, we always drive past on the way to gasing but we never eat here, don't know why. it's kinda like, when it's so nearby and accessible u just take it for granted? u know?LOL. the long grain looks really good. i don't like broken rice. long grain or japanese rice is the best! Just like ciki, we PJ-ans jz drive past all the time but nvr made a mental point to drop in (tho I did) but got distracted by the sheer new outlets opening ard us. J2Kfm – Don't worry…I thought the same. And I actually asked my friend whether it was an orphanage! muyiwa – Thanks for dropping by.